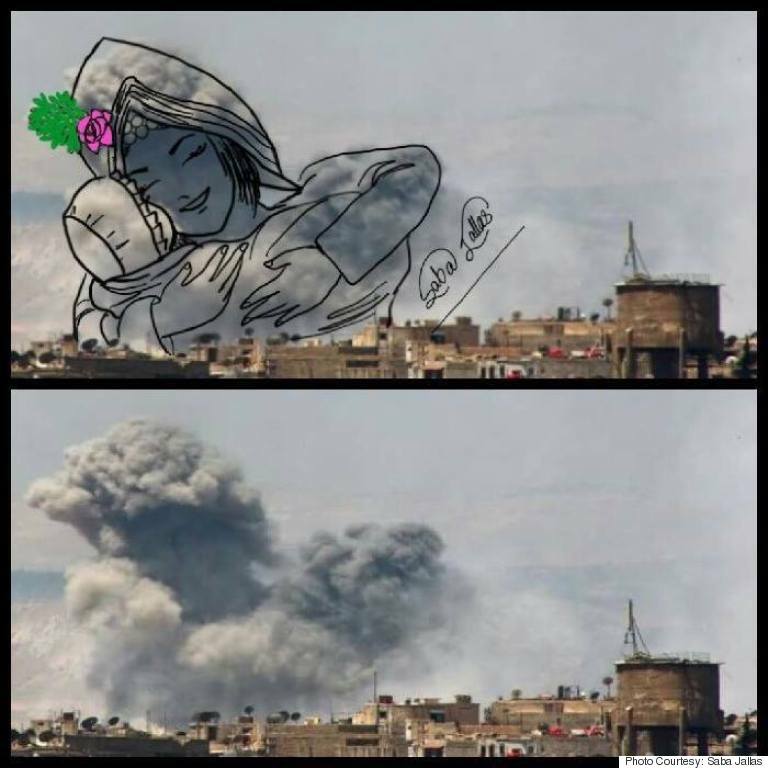 Yemeni artist Saba Jallas transforms photographs of smoke resulting from airstrikes or bombings in Yemeni cities into works of art, and posts them on her Facebook page. 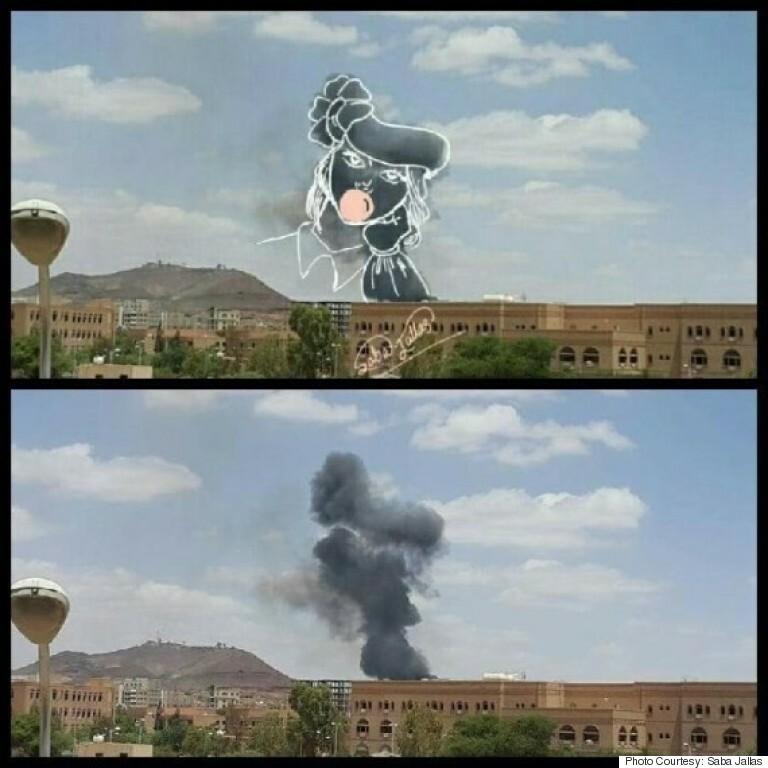 In black contour, she superimposes figures onto the smoke: of an angel playing the violin, a child holding her doll, or a mother rescuing her child from a burning fire, with the Yemeni flag draped across her shoulders. Jallas turns these images into artworks to create stories of hope and life, and to promote peace, love and optimism. In March, a Saudi-led Arab coalition began launching airstrikes to curb the Houthi rebels’ advance across Yemen. Up until last month, there were 2,204 recorded civilian deaths and 4,711 civilian injuries, according to the United Nations Office of the High Commissioner for Human Rights. 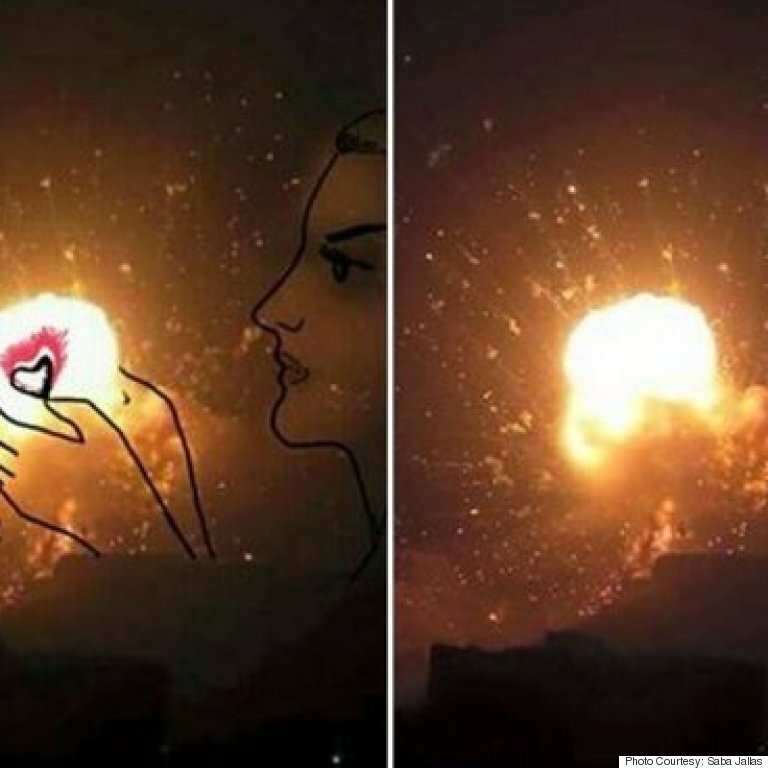 Jallas, who is in her 20s, and studied French literature, started collecting photographs -- shot by professional photographers and amateurs -- of the aftermath of airstrikes launched by the Saudi-led alliance to target Houthis and the forces of deposed president Ali Abdallah Salah. “I loved the idea of calling for peace and love through my work, because I believe that art is connected to humanity, and to the civilians that have been suffering under the fires of the war that has been going on for months,” Jallas added. Jallas' project was inspired by the work of Palestinian artists Tawfik Gebreel, Bushra Shanan and Belal Khaled, who transformed the soaring pillars of smoke, resulting from Israeli airstrikes on Gaza in the 2014 war, into artworks. 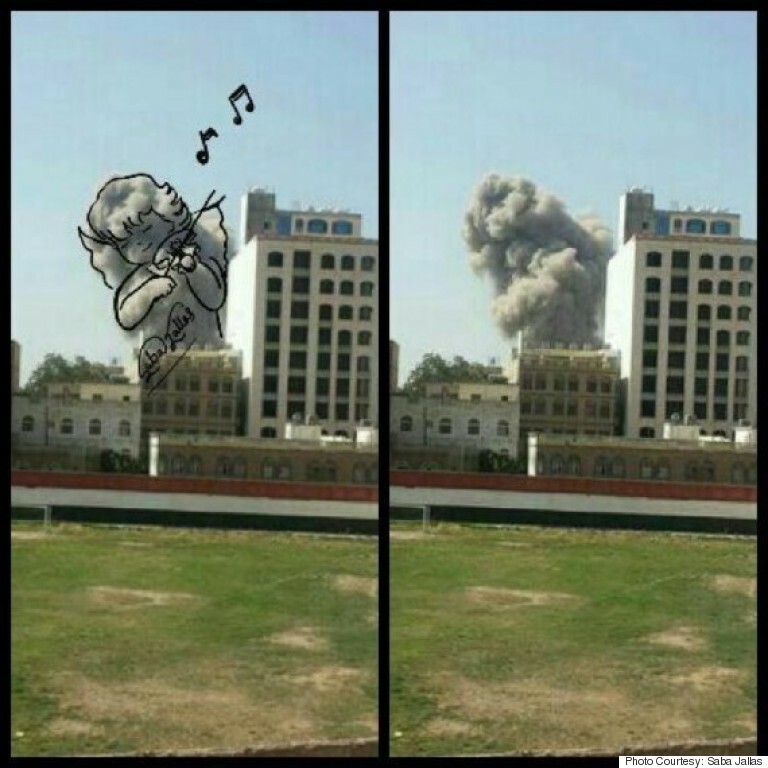 The Yemeni artist’s pieces have been well received on social media and on the instant messaging application WhatsApp. By calling attention to the women and children who are suffering as the war rages on, Jallas is appealing to the world to make a bigger effort to resolve Yemen's humanitarian crisis. In one of Jallas' pieces (see below), a woman wears traditional Yemeni accessories, as she tenderly caresses her child, as if communicating to the world that a new generation will grow up on this land, in peace. 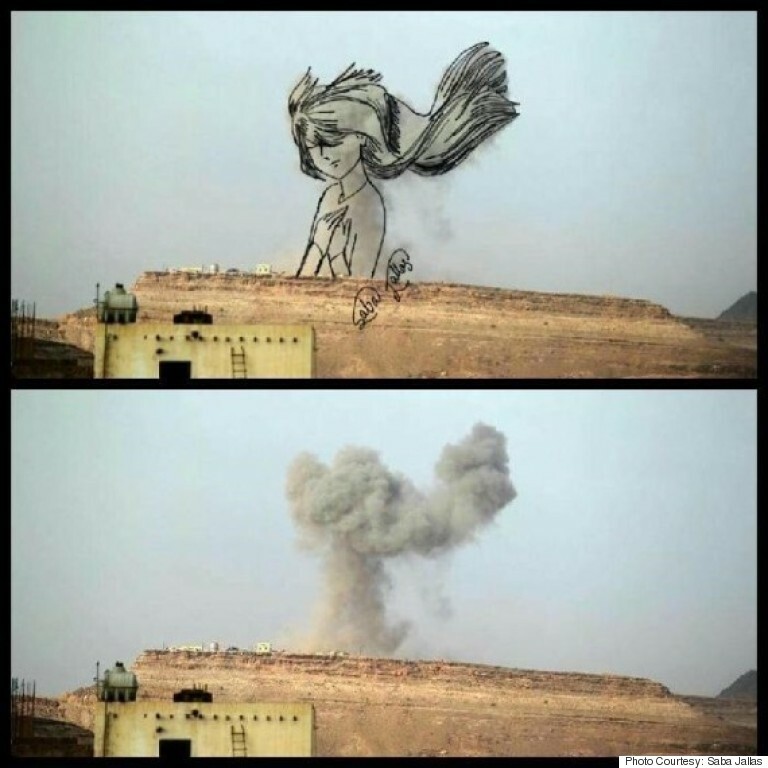 Jallas' art represents a space for hope and beauty, as it sends the message that the Yemeni people despise the war, and love life, contrary to what armed groups portray. This story originally appeared on HuffPost Arabic. It has been translated into English and edited for clarity.